On the trip north to Elkhorn. This time looking a bit like the Beverly Hillbillys, the breaks on our truck seized. Thank God we were only 15 miles from my sister's place. She was out celebrating her 33rd wedding anniversary. 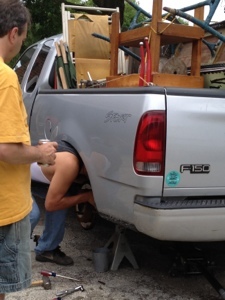 My nephew helped repair the breaks as I called to relinquish our booth space at the Elkhorn flea. Oh well. anyone see something in the truck you can't live without? It is still for sale! Thank God for nephews who are young, love repairing cars, and have not yet gone out to party for the night...And for husbands who know to douse the breaks (and thought to bring the water jug) when you are traveling far from home! 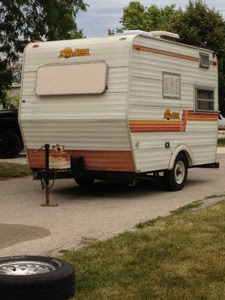 our little camper disconnected and ready for the trip. We ended up connecting with my sister and brother-in-law for a nice evening, I browsed her garden, left the flowers I had purchased for the flea market in a vase on her kitchen table...a collection of Red, White and Blue... and then we went for pizza and even stopped by a carnival to take some colorful photos of the nighttime lights. They shared their 33rd anniversary with us and that must have been what God was intending for us to do in the first place!
. nephew saved the day!
. left their home and was on the way to our home, a few miles away, they called and we met them for pizza and to look at my other nephews "dream home" on the river... he has been trying to work with the bank on now for months.
. dinner and pizza, touring Wauconda, IL for Wauconda fest.
. finally getting home and able to sleep in well into the morning! Amazing chain of events !!! I guess you really needed a rest.